Wiring: The ACS712 module must be connected to a 5V power supply. This example will detail the wiring for a Teensy 2.0 microcontroller to the ACS712 module and a CP210x UART to USB module. 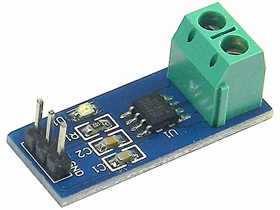 For this example the CP210x module will be used to power the Teensy 2.0 at 5V after programming. In order to observe varying outputs form the ACS712 module, a variable current is required. Since these modules are rated or high amperage, please pay attention to the test system as it may become very hot and could cause a fire. To connect the ACS712 module, connect the power and ground pins as indicated. The 'OUT' pin will be connected to the Teensy 2.0 on pin F0. This is one of the internal Analog to Digital Converter (ADC) pins. The ACS712 module outputs a voltage that is proportional to the current flowing through it. After wiring the unit, you can download the C example code below. This code is tested to compile via avr-gcc under Windows and Linux. You may need to install the avr-gcc compiler prior to using these files. 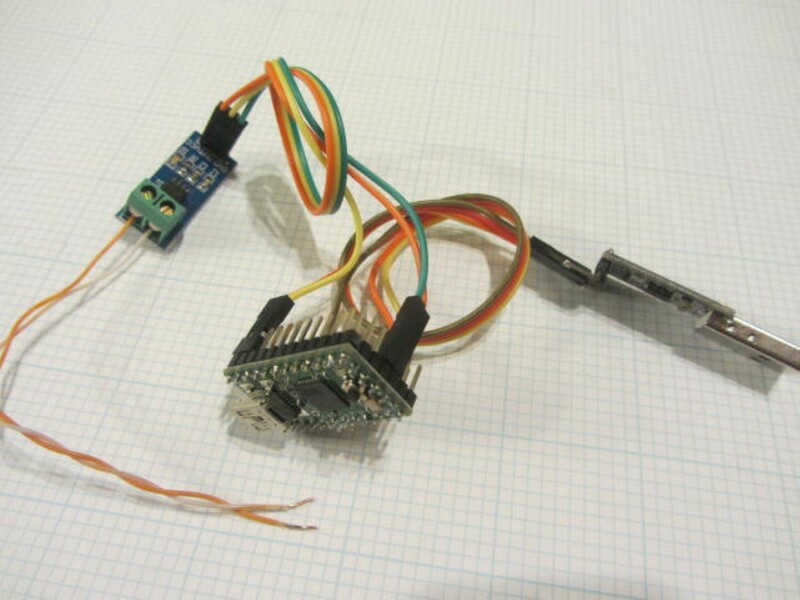 The code initializes the hardware UART on the Teensy 2.0 and transmits the value measured from PORTF, pin 0 (the ACS712 Module) repeatedly over the UART port at a baudrate of 34800. The protocol is set up for 8 data bits, no parity, and one stop bit (8N1). The output will be rather boring unless somethign that draws current is connected to the input pins of the ACS712 Module. To be able to fully use a serial (UART) port on a computer a 'terminal program' should be employed. One suggested program for Windows based systems isTermite (Local Copy). Termite is a versatile tool allowing for display and entry of both ASCII characters and raw hex values. Additionally, most operating system installs will need to download and install a driver for the CP210x family of USB to UART devices. These can be downloaded directly from Silicon Labsor local but older versions for Windows, Mac, or Linux (3.x.x). Driver installation will vary system to system but often only involves a simple installer utility. Consult Silicon Labs support if help is needed.